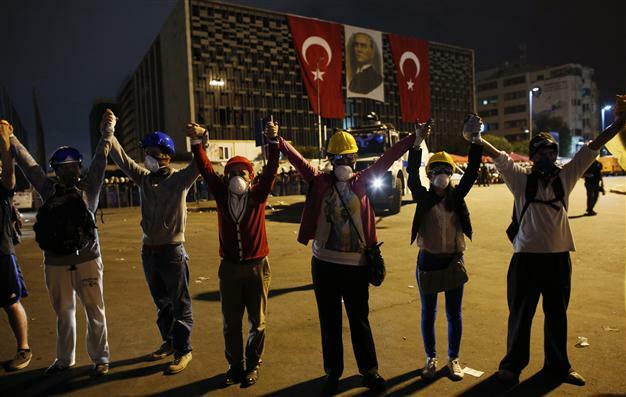 Responding to two weeks of nationwide protests, Turkish Prime Minister Recep Tayyip Erdoğan has raised the possibility of a referendum on the re-development of Istanbul’s Gezi Park. The Government’s plans to remove Istanbul’s last major green space, putting in a replica Ottoman-era military barracks housing a shopping mall, sparked sit-ins in Taksim Square at the end of May. The police attempt, using tear gas and water cannon, to disperse the demonstrators only led to the spread of protests in Istanbul and other Turkish cities. “The Prime Minister said that since we want to know what the people think, we can bring the option of a referendum to the concerned bodies. With a decision from the Central Executive Committee of the AKP [the ruling Justice and Development Party], the necessary step could be undertaken,” Hüseyin Çelik, an AKP spokesperson, told a press conference. Celik said the referendum would be about the conversion of Gezi Park to the replica of the historic Artillery Barracks. The demolition of the Atatürk Cultural Center would not be included in the referendum, as the building had to be removed because it was not strong enough to survive an earthquake. As people who believe in dialogue we think that a communication line has been opened. We are not anyone’s spokesperson. We want Gezi Park to remain a park and we want those responsible [for the police crackdowns] to be investigated. Erdoğan met with the 11 protesters, ncluding artists, academics and students, regarding the protests as part of the government’s attempt to listen to the demands of the demonstrators. The Taksim Platform, one of the leading organisers of demonstrations, said that they were not notified of a meeting and the group “does not represent” the protestors across the country. The Platform made six demands to Deputy Prime Minister in a meeting last week, including the halt to the plans for Gezi Park, a ban or severe restrictions in the use of tear gas and pepper spray, and the dismissal of officials involved in the police crackdowns. Hours after warning of an imminent police takeover of Gezi Park, Prime Minister Recep Tayyip Erdoğan has said he will meet a group of protest leaders. Two members of the Taksim Solidarity Platform, which was not involved in a first discussion with Erdogan on Wednesday, will be at the meeting. Eight artists are among the participants. Istanbul Governor Hüseyin Avni Mutlu reportedly told the delegation that no police intervention would be carried out during the night. The meeting was scheduled for 10:30 p.m. local time (1930 GMT). More on the regime’s claim to have disrupted the 14 February Coalition, a leading opposition movement — highlighted in a State TV video last night — by arresting 44 members…. The Ministry of Interior has declared that four of the members were involved in the death of a man killed in April 2012 by a homemade bomb placed inside burning tyres. Three men are charged with involvement in bombings in the capital Manama in November 2012 which killed two people and injured several others. Six have been held over an alleged arson attack. Others are listed as member of a “terror cell”, the “Al Imam Army” or of invovlement in “the Shirazi coup d’etat movement”. Prime Minister Recep Tayyip Erdogan’s Twitter account is repeating his warning, given to a meeting of his Justice and Development Party last night, that Gezi Park — the catalyst for nationwide demonstrations — will be cleared of protesters within 24 hours. A lawyer says 26-year-old Ether Sarisuluk, injured during clashes with riot police, has died. Sarisuluk had been on a life support for days. He was believed to have been hit in the head by a tear gas canister during protests in Ankara on 1 June. Three other protesters and a policeman have died during the two weeks of nationwide demonstrations. The head of the Turkish police union says six officers have committed suicide since the start of the Gezi Park mass protests two weeks ago. “We burn inside when we see those pictures [of police sleeping in difficult conditions]. As a union, the first thing we will do once the Gezi protests end is to take those photos and the rest of the evidence to file a criminal complaint with the prosecutor. I tell you, to put the policemen in those conditions is the same as treason to the country,” Faruk Sezer said.